Sticky: Scroll down for new stuff. Got a better caption or photoshop for this AFP pic? You could win a coveted Blog Ad on my side bar! 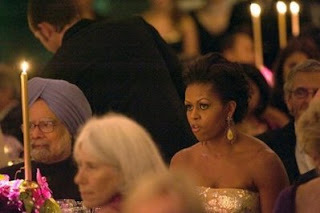 US First Lady Michelle Obama and Indian Prime Minister Manmohan Singh listen at the first official State dinner of Obama's administration in the White House in Washington on November 24. With arugula straight from his garden and entertainment by two Oscar winners, President Barack Obama took a fresh take on the state dinner in Washington's top social event since his inauguration. Leave a caption or photo link in comments, or Email a pic to me at the address in my profile. If you're sending a large animation, please provide a hot-linkable URL. You need not own a blog to win! I'll advertise your favorite charity, web site, or even your unused bath towels. "You should hear it, in the original Klingon"
Use Wyatt's links! I always do! (thought bubble) "Holy Vishnu, even the poorest of the poor in my country wouldn't resort to a K-Mart draperies for a dress." Michelle: "Jesus, it smells like curry in here." Give a little more light back here. Have I got anything caught in my teeth? Michelle thinks: "I am so proud of India"
I should have gone with the rag on the head look too! Michelle: "Damn, I've got to float a biscuit real bad. I hope the Prime Minister's body odor covers the stench!" Manmohan, don't feed the monkey! [M'chelle, later, to Barry] Honey, did you hear about how Vince Young orchestrated a grueling 99-yard drive in the waning seconds of the fourth quarter that ended with a 10-yard TD toss to Kenny Britt with no time left on the clock, to crush the Arizona Cardinals on their first visit to LP Field? WHY CAN'T YOU BE ALL COOL AND HIP LIKE VINCE YOUNG, YOU BOW AND KOWTOWING THIRD-STRINGER?!! Damn protocol, next State Dinner Barry sits next to me!